❝ Cosmic Sai Baba: “I am here my dear, thank you for asking me to come this day … and I am very pleased that both of you are here because it is an important message that I would like to announce, if you are prepared to be my messengers. And So do you have a question John? 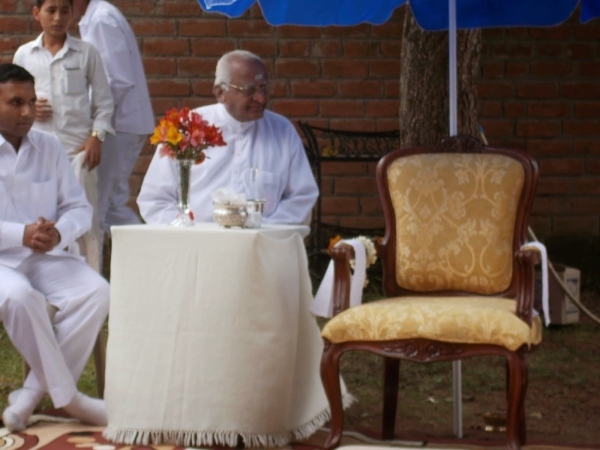 John: Yes, Did you appear in a light body to about 150 people or so at Kodaikanal in India recently? 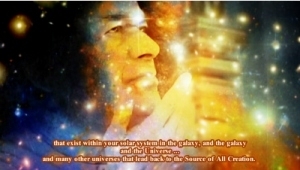 Cosmic Sai Baba: I did indeed, and that has gone out like an announcement – I wanted people to know that I was still around and that they could see me – and as it happens, shall we say as we move into a ‘higher frequency’ that has happened in more recent times – I am able to come here and present myself and be seen by just about everybody. And so yes, I did come. John: O.K. Well there are messages being received by others that you intend to come back and stay here in a light body for another 7 years and leave here at the time you promised you would leave your earth body and that was your 96th year? Cosmic Sai Baba: It is true, I have made the announcement to other mediums and I am asking you now, to confirm that it is so. That I am coming back, and presenting myself as people would see as a normal body. It is not actually a normal body, it is made of Light. It is a Light Body. I am able to come into a frequency quite strong – and so rather than looking like ghost – I will be seen as if I was another Sai Baba here – exactly the same as I was before I left my Earth Body. John: Yes. That is wonderful Sai Baba, we shall all look forward to that as we miss you very much. Now, do you want Valerie to assist you in some way in your journey? Cosmic Sai Baba: Well, I have asked Valerie and she has committed to help me – yes. In a specific way yes: I would like her to transcribe what we have been talking about this morning and putting it on email or even on the Net. In fact it would be good if it went onto the Cosmic Sai Baba site. And so yes, I would like her assistance for that. John: O.K. We can do that. Now, what about the book you asked her to write of people’s experiences since you died? Cosmic Sai Baba: It is true – the message did not come through another medium not quite as I meant it. But that is alright – I was really preparing Valerie for the fact that I was wanting this meeting to take place as it is now. And so, really , that is what I want her to do. And when I say I want, of course it is her choice, but I know she is committed to working with me and I know she will be very willing to do this. John. O.K. Now, that is all there is from us Baba; have you got anything to add that we should know? Cosmic Sai Baba: No, for today is to be focused on my message to humanity. For Yes, I am returning. I have been here all the time – as I have said – not always seen by everybody. I have been seen by quite a few around the Earth, who have spoken about it – but when it is coming in from one personal point of view it is not always readily believed or understood for that matter. And so yes, I will be coming and presenting myself so that everyone can see and I believe it will be an important step for humanity. In fact, I know it will be. And so this is my message to you both…I know you intend to travel to France, and I am very pleased about that … as we have said before we put our leads out and if you pick them up and run with it then we are very pleased that you have done that – because it is your choice, not ours. Although we have suggested it in the ether, if you like. And we have more work planned for you in France when you are on your journey – in fact it will start even before that – so you have my blessings, both of you and I work very closely with you, more than you realise – both of you. I appreciate your readiness and willingness to work with me so quickly when I put forth a suggestion in the ether and you pick it up and follow it – this gives me great pleasure and it makes my work with you very easy. So I compliment you both on that. Thank you my children, thank you – that is all for today.